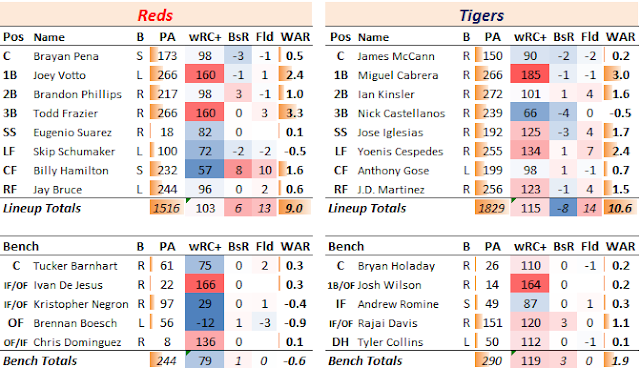 The Reds begin a fourish-game series against the Tigers today. Or, rather, they start a set of four games against the Tigers. Through an interesting quirk in the schedule, the teams will play the first two games in Detroit, and then fly to Cincinnati for games on Wednesday and Thursday. It's probably happened before, but I can't remember a time. I'm sure you folks can enlighten me. The tigers were seen by many as the favorites in the AL Central coming into the season. The Royals were expected to regress, and while the While Sox looked to have improved in the offseason, they probably weren't top-tier teams yet. The Indians looked to be their toughest competition. The Twins looked like basement-dwellers. Baseball being baseball, that's pretty much exactly NOT what has happened. Through the first two and a half months of the season, the Twins and Royals are dukeing it out for the AL Central crown, with the Tigers three games back and just three games over .500. While the Twins seem to be falling back to earth, the Royals seem to have legitimately improved this season, while the Tigers have been scrapping. Still, despite their aging roster, they still have a lot of talent, and they still have a good shot to make the playoffs this season. They hit well, and they catch 'n throw surprisingly well (this used to be a team that punted on fielding). Their downfall thus far has been their pitching, which has been merely adequate. With injuries to Alex Avila and Victor Martinez, the Tigers are playing a pair of prospects most days. James McCann, a 2nd-round pick in 2010, is more or less on schedule, having played a full season at AAA last year. He held his own, but showed himself to be an aggressive hitter with only modest power. Kiley McDaniel sees him as best-suited for a backup role on account of his fairly weak bat, but praised his defense. His early framing numbers are not great (3rd-worst in baseball), but he has made up for that a bit with his throwing arm. The other is Tyler Collins, who is their typical DH against right-handed pitching. McDaniel rates him as an average bat with good plate discipline, but below-average fielding skills. That more or less matches his performance so far, though his K & BB rates leave a lot to be desired. Otherwise, looking over the roster, aside from future Hall of Famer Miguel Cabrera (who looks to have rebounded from an "off" year last year), I think the most interesting guy is J.D. Martinez. Martinez came up as a mid-range prospect, but was released by the Astros at the start of last season. He signed on with the Tigers, and proceeded to have a superb 4-win series. Eno Sarris had a nice article on him recently, describing how he transitioned from a flat swing to an uppercut swing as a result of studying hitters while he was out with an injury. He'd already made those adjustments when the Astros released him last year, but I don't think anyone could have expected those adjustments would make such a difference. The whole thing rings of Jose Bautista, and it makes me wonder how many other players with flat swings could transform themselves by adjusting their swing. I'm sure that's easier said than done. Mercifully, for my own sensibilities, the Reds will miss Alfredo Simon in this series because he pitched yesterday. Instead, we get to see the Tigers' current Big Three: David Price, Justin Verlander, and Anibal Sanchez. And someone named Kyle Ryan. The marquee matchup will unquestionably be Cueto vs. Price in Cincinnati on Wednesday night. Those two are arguably the top two free agents-to-be this offseason, and both are pitching well; it should be a fun game. Sanchez and Justin Verlander look like pale imitations of their former selves. Verlander, in particular, has lost several mph off his fastball, isn't striking guys out anymore, is walking plenty, has a horrific 13% ground ball rate, and seems to be getting by on pure guile, with a lot of smoke and mirrors. He has a .133 BABIP, and 83% strand rate, a 5.74 xFIP, and a 6.49 SIERA. Yikes. The guy who caught my eye here was Joba Chamberlain. The former top Yankee prospect has carved out a good career as a setup guy, having last started a game in the major leagues in 2009. He has seemingly traded in strikeouts for contact this season, with a drop in both strikeout rate and walk rate. He has probably gotten a bit lucky, but he and Soria have very effectively shorted games thus far.